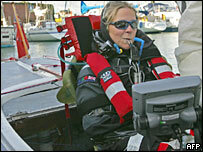 A paralysed woman has become the first quadriplegic sailor to cross the English Channel. Hilary Lister, from Kent, used controls powered by her breath to navigate her boat from England to France, reaching Calais after six hours and 13 minutes. The mechanism she uses is similar to one on her wheelchair and has two straws connected to switches to control the sails and steer the vessel. After arriving in France the 33-year-old said: "I am just thrilled." Mrs Lister, from Canterbury, has been a quadriplegic for four years, because of a progressive degenerative disease, reflex sympathetic dystrophy, which has worked its way up from her ankles to her neck. 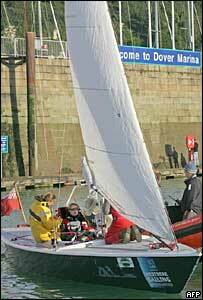 She can now move only her head, eyes and mouth and took up sailing two years ago as a way to boost her self-confidence. She said: "I cannot tell you what it feels like. "It is just tremendous, I am so grateful to everyone who made it possible. "It is very emotional for me. I was absolutely certain that once I got in the boat I could make it to France." She said she had previously been "a sporty, tomboy type", who lived an active life and enjoyed canoeing, swimming, rugby and hockey. "I want to get able-bodied people to rethink their views about the disabled," she added. "We do not need wrapping up in cotton wool and can go out and do silly or dangerous things if that's what we want to do." Mrs Lister, who lives with her husband Clifford, used her Channel crossing to raise money to allow sailing opportunities for other people with disabilities. She now hopes to sail round Britain next year.